Your bid is a commitment to purchase the item if you are the winning bidder. You must be registered on our site to bid! You cannot bid as a guest. If you have not registered on our site, the first thing is to go to My Account and register. All our auctions run for three days each starting at midnight and begin ending starting at 9 pm eastern standard time. You must be logged in to bid on our monthly auctions. There is no buyer’s fee on our auctions. In some cases, there may be a reserve placed on the item. If so the auction will indicate when the reserve has been met. Bidding increments will be at $1 or $5 depending on the value of the item. The auction functions like the others you are familiar with (eBay etc.). You can submit a maximum bid and the site will bid up to that bid for you, bidding only one increment above what is necessary to secure the high bid, up to your maximum. Putting it simply, your bids will be executed at the lowest prices allowed by reserves and other bids. If two people bid the same maximum amount, the person that bid first will win the auction. Congratulations! If you are the winning bidder, you will receive an email indicating you have won the auction. You must acknowledge receipt of that email by clicking on the link provided. From there, the checkout process works just like the regular site. Your item(s) will be packed and shipping cost calculated. You will then receive a PayPal invoice from us with shipping included. Shipping costs are our actual cost with nothing added! Please note, WE WILL NOT ANSWER QUESTIONS ON HYPOTHETICAL SHIPPING COSTS FOR AUCTION ITEMS! We ship the least expensive way possible on all orders and ship either USPS or Fed Ex for all our shipments. We only charge actual cost so be confident that you are only paying what we pay with no handling charges or upcharges of any kind for shipping. We will run auctions sporadically based on our inventory at the time. You will receive notification one week out from our auction dates. You will receive a second notification when the auction begins and a third just before the auctions ends. Auctions will end at staggered times, giving all the opportunity to bid on all items. Auction sales are final unless the item is misrepresented in some fashion which is never our intent. 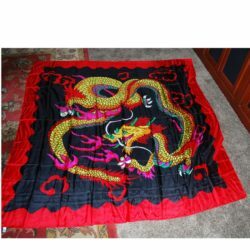 We describe truthfully and include photos of the actual item being auctioned. 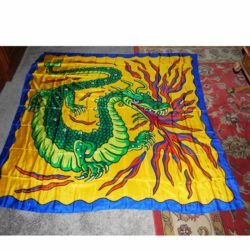 Six Foot All Silk Dragon Foulard; beautiful!